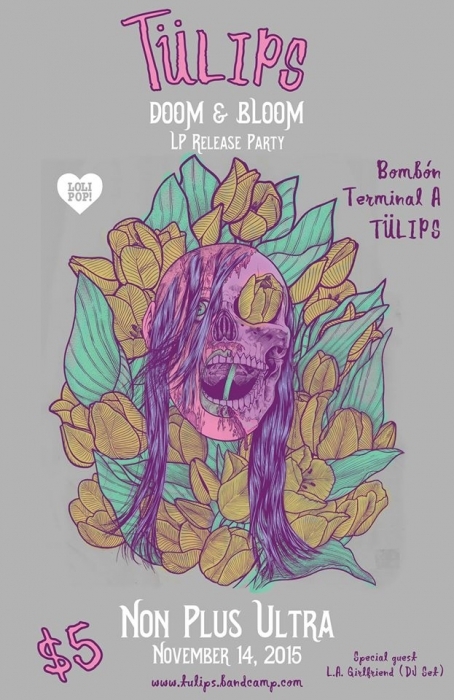 The TÜLIPS release party last Saturday night was DIY tight — a full Doom & Bloom experience from dizzying start to shoegazing finish. L.A. 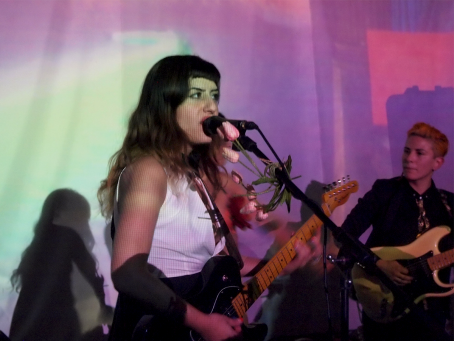 Girlfriend Sydney Banta DJ'd and slipped in some new tracks from her upcoming LP Neon Grey, while San Pedro girlfriends Bombón worked the house with some frothy surf rock jams. As Angie and Taleen took the stage, they gave shoutouts to their producer Greg Katz way back in the audience, and introduced Jen Spazmaster to dance as the crowd got up close and cozy. And then TÜLIPS roared, had everyone spinning from "Vertigo" to the oscillating dregs of "Hopefully Hopefully". Some bands throw down their debut album a year into formation. Others go at it a little longer. For best friends Taleen Kali and Angie Bloom of TÜLIPS, it's been a four-year wait, but well worth it. The dual guitarists/vocalists come from completely different musical backgrounds: Taleen's the "Doom", all about dirtbox growl and migraine-inducing feedback, while Angie's the "Bloom", slick with 50's jangle and doo-wop spirit. They're an unlikely pair, but continual back-and-forths with mixtapes have drawn these polar opposites together. And when glued down with drummer Travis Moore and bassist Miles Faster, TÜLIPS keep it classy, leaving local crowds reeling from tinnitus in pools of sweat. Don't believe me? Just ask the bands that shared their bills, like LA FONT and Bür Gür.